This BAdI LE_SHP_DELIVERY_PROC for transaction VL01N and you can implemented this badi for checking delivery data before saving. You can create implementation using transaction code SE18. 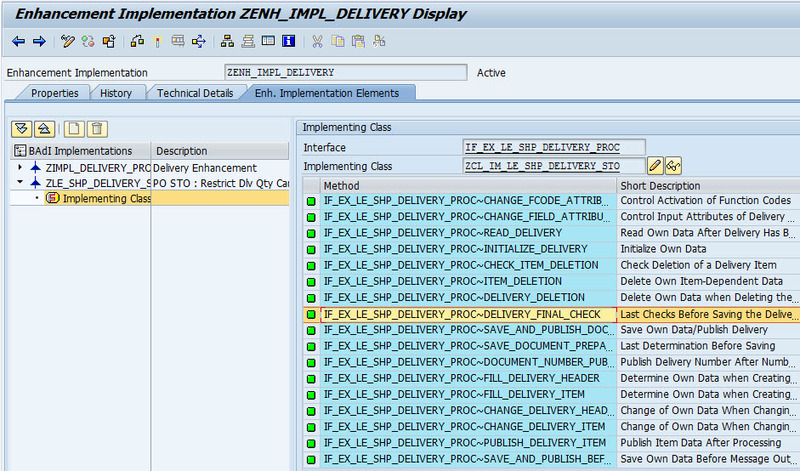 For checking delivery data before saving, you can use method DELIVERY_FINAL_CHECK. Please check this ABAP Code. METHOD if_ex_le_shp_delivery_proc~delivery_final_check. DATA: lf_cannot_over TYPE c, ls_finchdel TYPE finchdel. DATA : ls_xlikp TYPE likpvb, ls_xlips TYPE lipsvb. DATA : lv_menge TYPE menge_d, lv_tot_menge TYPE menge_d, lv_ekbe_menge TYPE menge_d. DATA : lt_ekbe TYPE TABLE OF ekbe, ls_ekbe TYPE ekbe. LOOP AT it_xlikp INTO ls_xlikp. IF ls_xlikp-lfart = 'Z4LN' AND if_trtyp = 'H'. CLEAR lf_cannot_over. "===== Add your ABAP Code. ==== ENDIF. ENDLOOP. IF lf_cannot_over EQ 'X'. CLEAR ls_finchdel. ls_finchdel-vbeln = ls_xlikp-vbeln. ls_finchdel-pruefung = '99'. ls_finchdel-msgty = 'E'. ls_finchdel-msgid = 'ZMM'. ls_finchdel-msgno = '005'. INSERT ls_finchdel INTO TABLE ct_finchdel. ENDIF. ENDMETHOD. LOOP AT it_xlikp INTO ls_xlikp. IF ls_xlikp-lfart = 'Z4LN' AND if_trtyp = 'H'. INSERT ls_finchdel INTO TABLE ct_finchdel. You can add message error or warning by populate internal table CT_FINCHDEL .